The following example uses a pair of arrays to hold corresponding lists of words, characters or phrases separated by commas. In a practical use of the technique, the above example as shown in the macro below, is used to replace smart quotes with straight quotes (and vice versa), however the list and macro could be modified to be used to replace or process any sequence of words or phrases. In the following example, the words and their replacements are stored in adjacent columns of a two column table stored in a document - here called "changes.doc". The name is unimportant and Word 2007/2010 users could use docx format. The table could also have more than two columns, but only the first two columns are used. The final example in this trilogy of replacements using lists was prompted by a Word forum question. The user wanted initially to highlight words and phrases in a document from a list, which was easily achieved using a variation of one of the above macros, and the he ventured the possibility of the user choosing from a number of possible replacements. How practical this is in a real life situation I cannot say, but the principles involved I felt were interesting enough to repeat them here. In this instance the macro uses a multi-column table. The first column contains the words to be located, the subsequent columns contain the replacement choices. The columns should be filled from left to right. Not all the columns (except the first) need contain any data, but the columns must be filled from left to right with no gaps. If only the second column has data, the found item is replaced with the content of the second column If more columns to the right of the second column have data, the choices from the second and subsequent columns are presented as numbered choices in a list. If none of the columns, except the first, contains data, then the found word is merely highlighted. There must be no empty cells in the first column! Const sFname As String = "C:\Path\Changes.docx"
'Identify the document containing the table of changes. 'The table must have at least 3 columns. The following macro sets a centre aligned tab, centred between the current margins, and a right aligned tab at the right margin. The following macro will extract all the e-mail addresses from a document to a new document. The macro works on the principle that autocorrect is capable of converting e-mail addresses and web links to hyperlinks. The macro then examines those hyperlinks and extracts any that contain e-mail addresses to a new document. the original document is unaffected. 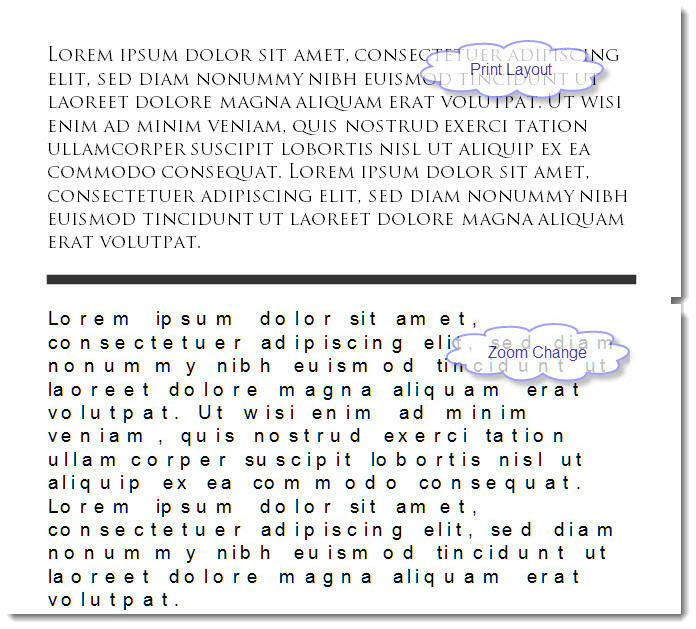 It has been observed that occasionally some open type fonts display incorrectly in Word 2010, as in the following illustration, or the display becomes completely scrambled with the words all stacked together. It has also been observed that switching to an alternative printer will fix the issue. The following macro does just that, using the One Note driver that comes with all versions of Office 2010, then restores the original printer driver. ActivePrinter = "Send To OneNote 2010"
2010, the print preview was changed to part of the print dialog on the File Tab of the ribbon. The familiar print preview from earlier versions can be added to the QAT (Quick Access Toolbar) with Print Preview Edit Mode from the All Commands group of the QAT editor. The following macro intercepts that function and sets the zoom level from the default of full page to 100%. Change the 100 to reflect any personally preferred zoom level.